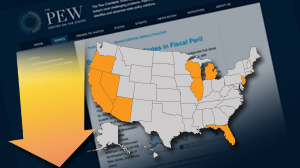 Enormous budget deficits in nearly every state across the country are "wreaking havoc" on government employees, the services they provide, and the residents who need them most, according to a new report by the Pew Center for the States. Dwindling state tax revenues during the recession have forced states to furlough workers, raise taxes, crowd more kids into classrooms, and trim social services. But experts say those measures and others can only go so far in keeping many states from going broke. "There's no question this is extraordinary. The worst situation in 50 years," Susan Urahn, director of the Pew Center for the States, told ABC News. "Fiscal year 2010 will be just as bad as it was last year. We saw a $180 billion cumulative budget gap in 2009 and predict the same for 2010." Urahn says despite much national attention on California's budget crisis – the worst in the country -- nine other recession-stricken states are facing a similarly dire situation. Arizona lawmakers are staring down a $1 billion gap in their 2009 budget with no immediate solution in sight. Rhode Island, the smallest state, continues to post among the highest unemployment and foreclosure numbers in the country. Michigan is grappling with "a 1960s-sized budget," while Nevada struggles to raise taxes in light of a provision that requires voters to first amend the state's constitution. Oregon, which experienced the greatest drop in state revenue over last year, faces a similar dilemma as voters in January 2010 get the final say on new income taxes to close the gap. The Pew report lists Florida, New Jersey, Illinois and Wisconsin also among the top ten states facing the worst combination of foreclosure rates, jobless numbers, state revenue losses, budget gaps, legal obstacles to balanced budgets and legislators' poor money-management practices. "These are the worst numbers we've ever seen in the decades," said Scott Pattison, director of the National Association of State Budget Offices. He says state budget crises have impacted every part of state government, including the employees and residents they serve. Can State Layoffs, Furloughs Close Budget Gaps? "The impact of plummeting tax revenues is really coming home to roost now," Steve Kreisberg of the American Federal of State, County and Municipal Employees told ABC News. More than 110,000 state and local employees have been fired in the current recession, according to the Center for Economic and Policy Research. That number includes over 40,000 teachers and 4,000 police and firefighters. Some states have opted against layoffs in favor of forcing workers to take furlough days, or unpaid days off. On Thursday, New Mexico became the latest state to implement furloughs after Gov. Bill Richardson ordered 19,000 workers to take five unpaid days off. The move is expected to help the state deal with a $650 million budget shortfall. "It amounts to a 2 percent pay cut in lieu of laying off maybe 400 people," Kreisberg said of the New Mexico case. But furloughs come with additional costs for workers and residents. In Hawaii, where school teachers have been furloughed for 17 days this year, students will receive less time in the classroom and parents will be forced to find and pay for childcare. Furloughs are also meaning longer waits for unemployment claims processing and other services, in some states, and reduced numbers of police and firemen to protect public safety. "What's also overlooked," Kreisberg said, "is the tremendous increase in stress on the workforce at a time when workloads have increased and pay has decreased." Staffing reductions and increased demand for state services during the economic downturn are making it impossible for some workers to afford taking time off. "Many state workers have said they simply cannot afford furlough days. They work from home or sneak into the office out of extreme dedication and passion for public service," Kreisberg said. Is there a light at the end of the tunnel for states in murky financial waters? Kreisberg says unless states can devise creative solutions, the coming year will be "absolutely disastrous not just for state workers but for the entire economy." The Pew Center's Urahn agrees. "It's tough to continue to do across the board cuts in states like Michigan, where you've cut for years and years and years," she said. "I think it's gonna be tough... the challenge is that it's not a 'this-year' problem; it's a structural problem with how states spend." And those are the types of problems that don't tend to get resolved quickly. National Governors Association director Raymond Scheppach predicts, "states will not fully recover from this recession until late in the next decade."